Who’s the leader on the club with home runs for you and me? In Philadelphia, it’s Rhys Hoskins. The clean-up man in a revitalized lineup for the Phillies hit two home runs on Monday night to help edge the Washington Nationals, and he may have found a new pair of good luck socks. 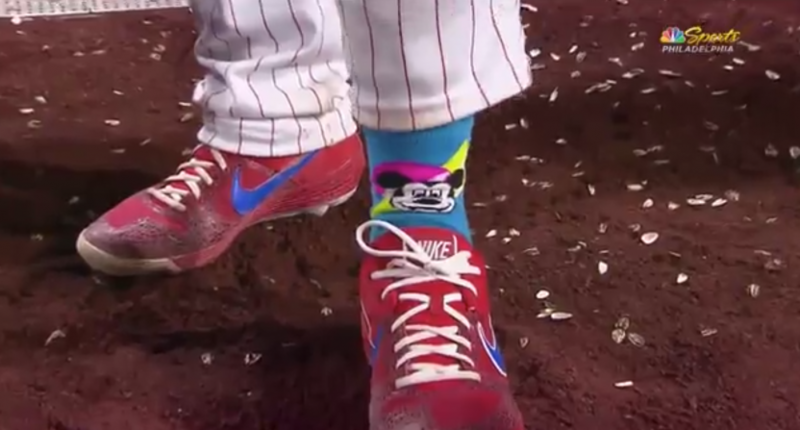 In a postgame interview on NBC Sports Philadelphia, Hoskins was asked about his socks, which were apparently a gift to the team from Bryce Harper. As Hoskins put it, “there’s something magical about Disney socks.” Hoskins then showed off his Mickey Mouse socks. No word on who on the Phillies has Donald Duck or Goofy socks, but if nobody on the Phillies beat starts hunting down that information then they aren’t doing their job. Hoskins has been on a hot streak the last few games. Since opening the season with a grand slam on Opening Day, Hoskins cooled slightly at the plate behind Harper in the lineup, and he had a costly error in a road game against the Nationals that eventually led to the first loss of the year for the Phillies. But the last few games have seen Hoskins get in a groove with patient at-bats and a careful eye on the ball. He saw over 70 pitches in a weekend series against the Minnesota Twins, and Monday night saw Hoskins hit his fourth home run in three games. More importantly for the Phillies, the home runs are coming at great moments in the game. The first home run off the bat of Hoskins against the Nationals Monday night came in the bottom of the sixth inning with the game tied 2-2. After the ball just cleared the fence in Citizens Bank Park, Hoskins rounded the bases for what was the 25th time since the start of the 2018 season that a Hoskins home run tied a game or gave the Phillies the lead. This @rhyshoskins homer was his 25th since the start of last season that either tied the game or gave us the lead. That's what we like to call "clutch". Hoskins would do it again in the bottom of the eighth inning with a solo home run to cushion the Phillies lead to two runs. As it turned out, that would be the game-winning run as the Phillies closed out a 4-3 win. Is it the socks? Probably not. But if Hoskins is going to continue swinging a bat like this in the middle of the Phillies lineup, Harper may want to send him another shipment of Disney socks soon.